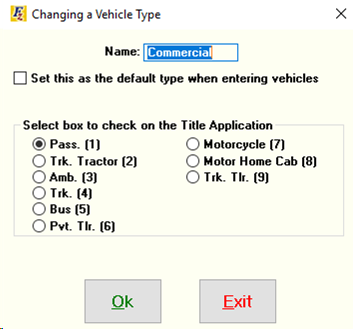 For Dealers in Mississippi, there is additional functionality in the Vehicle Type screen to select a vehicle and change it’s “type” by clicking on the "Change Highlighted Type" button. The following screen appears after clicking “Change Highlighted Type”. 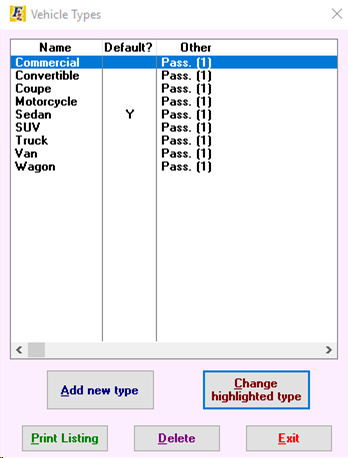 For this example, when the Vehicle is designated as Mid-Size in the Vehicle file, the ‘Pass. (1)’ box will be checked on the Title Application. Sales Tax used to be charged on the Finance Charge if the dealer was carrying the note (BHPH). It was not charged on the Finance Charge if the sale was not BHPH (Outside Financing). Starting July 1, 2014, 2014 Mississippi House Bill 260 went into effect, which makes interest on BHPH sales non-taxable.